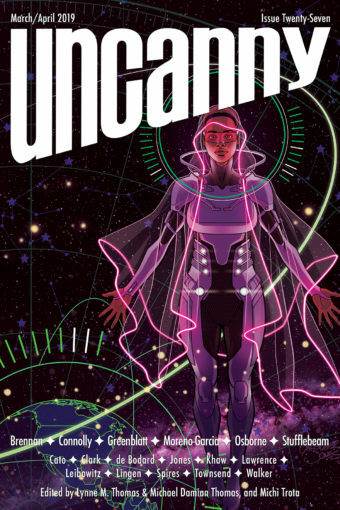 Would you like to hear the teaser trailer for the Uncanny Magazine Podcast? Episode 1 launches on November 4th and features an editors’ introduction, Maria Dahvana Headley’s story “If You Were a Tiger, I’d Have to Wear White” and Amal El-Mohtar’s poem “The New Ways” (both read by Amal), and an interview with Maria conducted by Deborah Stanish. Episode 2 launches on December 2nd, and features an editors’ introduction, Amelia Beamer reading her story “Celia and the Conservation of Entropy,” Sonya Taaffe’s poem “The Whalemaid, Singing” (as read by Amal El-Mohtar), and interview with Amelia conducted by Deborah Stanish. Erika Ensign and Steven Schapansky are amazing producers. We hope you enjoy listening to it as much as we enjoyed making it for you.